Have you been told that you require root canal therapy? It’s important to understand what root canal therapy involves so you don’t feel uncomfortable when you come to our Richmond dental clinic for the actual procedure. The Root Canal is the name for the space within the root of the tooth, it is a hollow area that contains soft tissues (the pulp and nerves). The number of these hollow canals (one to four) in a tooth depend on the type of tooth and the pulp nourishes and hydrates the tooth. Why do you need Root Canal Therapy? However, if your dental pulp is exposed, through a cavity or fracture, or becomes infected (abscessed) for any reason, it will likely require root canal therapy to allow you to actually keep the tooth instead of extracting it. These days, root canal therapy is relatively pain-free and can be done in as little as one appointment. What to do if you need Root Canal Therapy? Contact Affinity Dental Clinic, your Richmond dentist, if you have any questions about root canal therapy or if you would like to book an appointment. 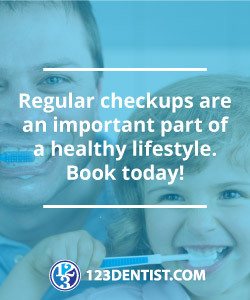 Subscribe to Affinity Dental’s blog for more dental secrets and contact us today to take care of your oral health care. We’re social, too! Follow us on Facebook, Twitter and YouTube. At Affinity Dental Clinic, we’re very proud and fortunate to be members of 123Dentist – Community Dentist Network.